CBN – By: Talia Wise – “Tensions are running high at several schools in Cleveland, Ohio, after the district banned prayer before athletic events last month. Students and parents on both sides of the issue are speaking up. It all began, when West Branch School District stopped the long-standing tradition of prayer after receiving a letter of complaint from the Freedom From Religion Foundation (FFRF). The letter claims that a prayer was made over the loudspeaker before a high school basketball game, which FFRF says is unconstitutional. ‘It was reported that all in attendance were asked to remain standing for this prayer and that the prayer was Christian in nature,’ the letter reads. Superintendent Tim Saxton sent a letter to parents stating schools would stop praying until the district could get in contact with its lawyer, but a large part of the community is pushing for prayer to return quickly. CBN News spoke with West Brant parent Kristen Dwaine Everett who helped start a drive to reinstate the prayers. She and Brandy Pidgeon, another parent, started printing ‘Prayer Matters’ t-shirts and sold 200 within 24 hours and more than 600 overall, so far. Pidgeon’s son Nick, who plays on the basketball team, came up with the idea for the t-shirts. ‘To these boys, it matters and we want to bring it back if we can,’ she added. In response, some students have created ‘Coexist’ t-shirts to show support for what they believe is an inclusive environment at school. The dueling t-shirts are causing tension at West Branch High school. Addie Morris, a 12th grader at West Branch Highschool, said she supports prayer as long as it is private and does not infringe on others’ freedoms. ‘I know that I live in a prominently Christian community and I am aware that the community members all feel that the prayer is very important, but the tradition in a tiny community is not an excuse to violate the Constitution or my right to religious freedom,’ she wrote to CBN News. ‘There are other students who feel the same way that I do and believe we should all learn to coexist and set religion aside so that we can focus on our educations,’ Morris added. 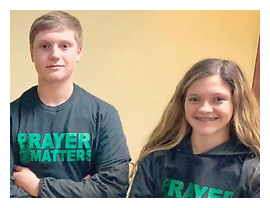 ‘Our lawsuit won’t be magically fixed due to the fact they’re selling shirts that say ‘Prayer Matters,’ ‘ West Branch High School student Katie Mikes told CBN News.